Spend a day in a museum could be the best plan for a weekend. Once the exhibitions are checked, the next thing is to check the museum's restaurant. Instead of waiting for long lines to buy tickets and walk behind tourists with autoguides, you can plan after the visit a brunch in the museum’s cafeteria. Many museums offer the possibility of having a coffee during or after the visit. making the feeling of tranquility and that time stands while you watch works of art, continues while you’re sitting among pieces of art. One of this spaces is the restaurant of Casino Luxembourg - forum d’art contemporain which restaurant it’s a cozy space full of details. We can find in the basement the Café(si)no, the old restored Saint-Hubert salon now designed and remodeled by Claudia Passeri. 18th century panelling painted in pink with moldings and details similar to those of the great palaces. To counter this classic frame, we find a large white table and dark chairs around perfect to have a meal. If you don’t want to seat at the table, you can share the huge bank to take a drink. 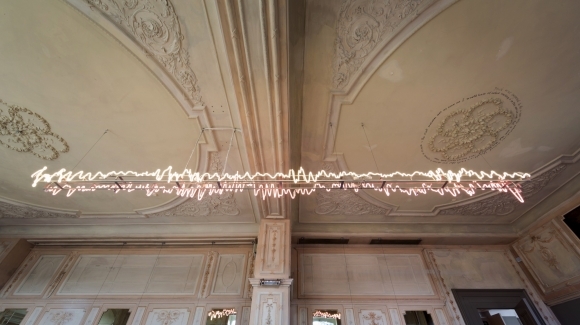 The space also recreate the history of the Casino in one neon in the central part of the room called the Zeitgeist – Karl Cobain. It consists of two sound waves, one with the first phrase of the Communist Manifesto, in which the first era of the casino is represented, built for the elite of the time. And on the other side we can see the representation of a phrase of the song The man who sold the world written by David Bowie and sung by Kurt Cobain, representing the moment in which the muse began to host contemporary works and was open to all public. The perfect space to take a break of being a tourist.